I hope the happy seat hacker dropped a cast iron intake on his foot! What was the point? Not a fan of the color green maybe? I have a complaint. Not just my usual one about unfair business practices at Walmart or how bikinis just aren’t small enough. This one is about etiquette. I don’t mean how we don’t always extend our pinky finger when drinking mid-day tea, I mean junkyard manners. They do exist. Or should, anyway. Being "The Earth Roaming Car Guy," I find myself in quite a few salvage yards. I love them. 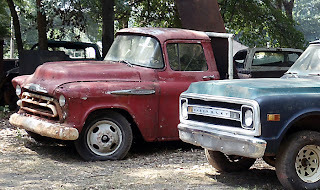 My complaint is not with them (although sometimes it can be frustrating to see a really cool junkyard and be denied access inside), it is actually with other salvage yard patrons. Let me explain. The other day I found a near perfect 1969 Ford LTD bench seat in green with no tears or rips. I return a day or two later and someone had placed (read “slam dunked”) an a/c compressor right there on the seat. I almost didn’t see the compressor due to it being buried in what seemed like two full buckets of transmission fluid soaked gravel. Why? A senseless crime. My buried treasure really was buried now. The seat survived with a 5-inch rip that it did not have before. 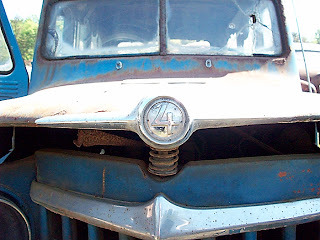 The same day I struck up a conversation with a gentleman that seemed to be in love with a 1970 Lincoln Mark III. The car was super innovative for its time. 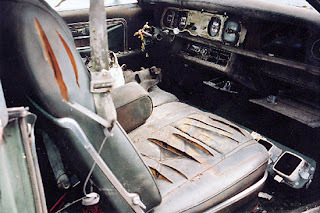 Decked out with a unique dash and unmatched classic luxury styling, in its day the car was gorgeous. It would have been a great find for someone like him who appreciates things like this. 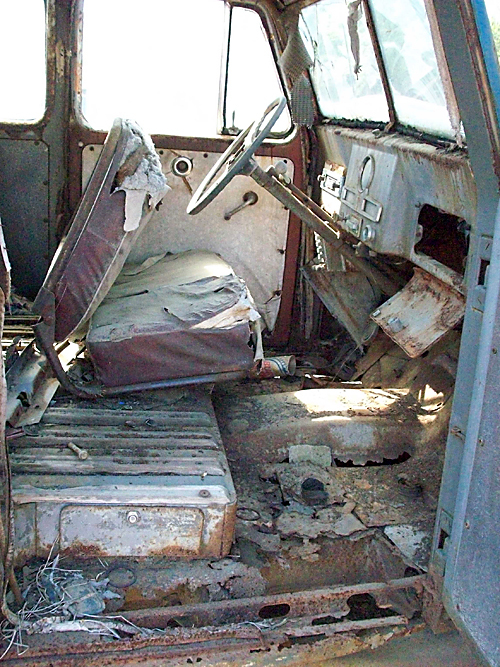 It WOULD have been had someone not taken a razor blade to its original green leather seats. Again…..why? Did someone just have a vendetta against vintage green seats that day? I don’t think so. I say it's bad manners. 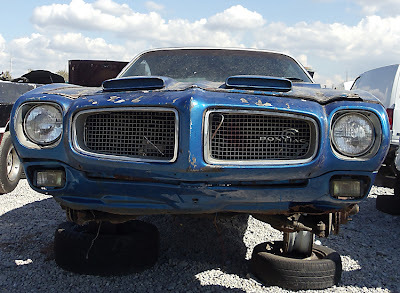 Once I found a complete 1978 Trans Am in a salvage yard with a complete running 400-cubic inch Pontiac engine. Only one problem, the entire side and rear of the car were smashed terribly. 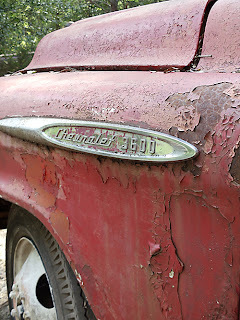 The attendant explained that it came in as a complete, driving, straight car that did not need to be in a junkyard. But, before anyone could rescue it, a teenage employee decided to do some donuts in the mud. He was unaware of its positive traction rear end and ended up smashing the sides and rear against something solid and round. I saw the remains. Take it from me, someone would have really given that car a good, deserving home. I suggested the electric chair for that employee, but unfortunately, we don’t live in Texas. 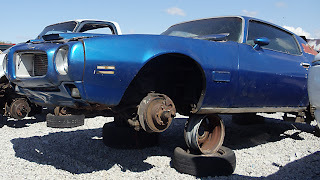 Another poor Trans Am was spotted by a fellow car guy at a salvage yard the day it landed at the junkyard. It seemed like a super straight car. “You must come see this!” he said. By the time I got there (24-hours later), the unfortunate Pontiac seemed to have lost a battle with a fork lift. 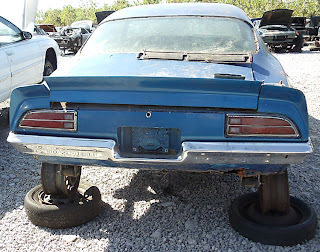 Trunk bent, rear spoilers broken beyond recognition, front fender hanging in a jagged painful position…..it hurts me just to think about it. 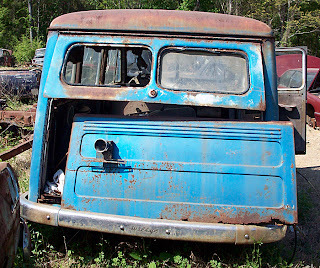 Maybe the idea of a salvage business is not to sell things like I thought it was? 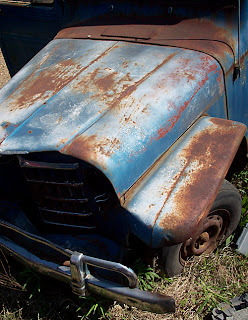 How many times have you located a parts car that had some really great things on it, only to find someone destroyed your needed parts and left them for dead, while not so carefully removing what they needed? It happens way too much. Just because they don’t need it, does not mean someone else will not either. Do onto others! I am convinced that each state needs to issue licensing to own a Sawzall. I once bought a front bumper cover that still had a few inches of the original fender attached to it. No anesthesia even. Shame. I have a feeling if your reading this, you probably feel the same way I do. Real car hobby people just don’t do things like that. It's like we have a code. We all have similar stories. Some may be worse than mine. I don’t want to know. Thanks for letting me vent. Happy hunting. Myth: 1971 Firebird Formulas don't end up in junkyards anymore. Bad stuff happens to good cars. This 1971 Pontiac Firebird Formula (or is it a base 'Bird, Espirit or modified Trans Am?) had the misfortune of landing in the local pull-your-own parts yard in Birmingham, Alabama. 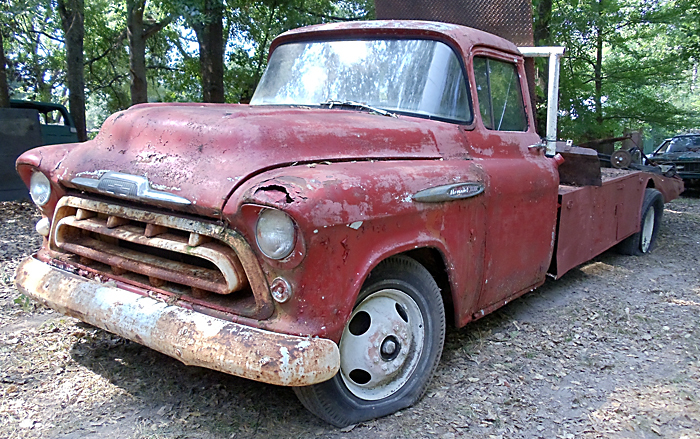 A reader tells us its fiberglass Formula hood had a jagged, shaker-sized hole carved into it (ugh!). Despite the glaring damage to the hood, many other rare, early second generation Firebird parts are waiting on a date with the crusher. Look at that beautiful, straight, chrome rear bumper. More good parts than bad ones on this 'Bird. '70-'73 Firebirds shared many interchangeable parts. Try finding a set of tail lights, front bumper assembly, rear bumper, fenders and doors. Grab all these parts: fenders, doors and front and rear bumpers. It will only set you back for a total of $200 at this yard. That's a steal for Pontiac F-body parts of any year model. 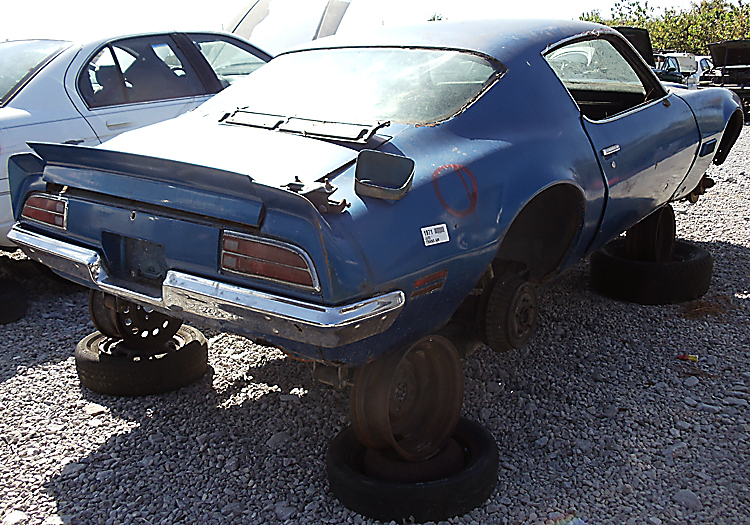 This '71 'Bird will fly away in pieces. 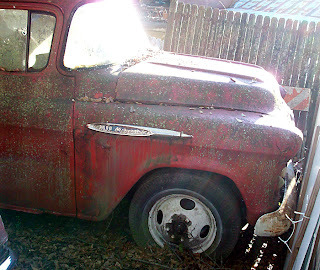 Another junkyard casualty that should have been saved. The center chunk had been removed from the 8.2" 10-bolt rear end. No VIN number to decode here but a few clues lead me to believe this is a Formula. The wrong year, rear spoiler appears to be from a '79-81 model. A Trans Am decal can be seen beneath the blue paint. A previous owner had racing aspirations with this 'Bird. Cutting a hole in the macho Formula hood wasn't enough. They bolted a set of trac bars in the rear to compliment the Ram Air and Shaker set-up. Sometimes more is less. A likely scenario is this Formula's owner had T/A envy. No Espirit or base 'Bird owner would go to this much trouble to look like a half-breed. The iconic, aggressive profile of the '70-73 Firebird Formulas deserves better than this. It's not the soccer mom's grocery getter, yet. 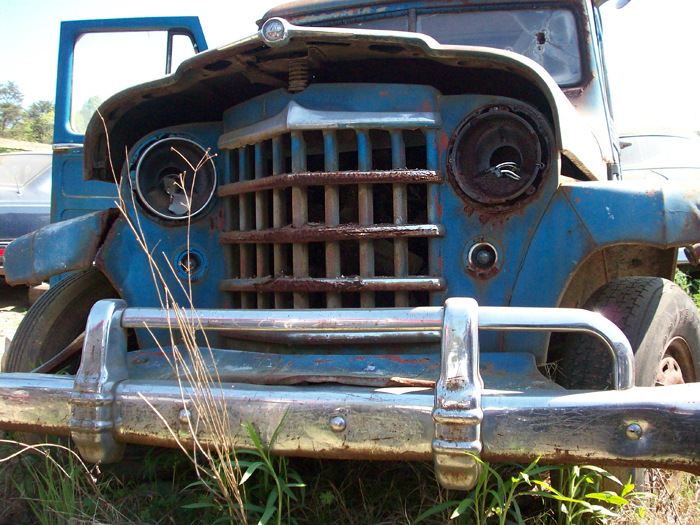 In 1946 the Willys Jeep Station Wagon was the first steel-bodied, sport utility vehicle built for the masses. After World War II, growing families and weird, great-uncles looking for tough, "General Purpose" (GP = Jeep) vehicles bought Willys "Jeep" Wagons. By 1948, Willys developed the 4-wheel-drive blueprint for millions of SUV wagons to come. Leather seats, DVD players and navigation systems would arrive much later. 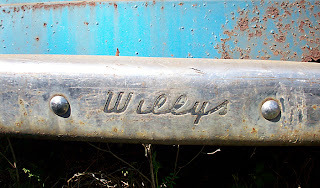 Willys built more than 300,000 station wagons and continued their production from 1946 through 1965. I image a majority of those eventually became storage sheds for fishing gear, a final resting place for dull chain saws and/or parked in the back of your weird, great-uncles yard. 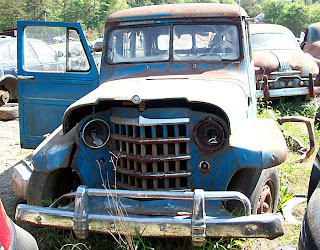 Some landed in the junkyard like this 1950-ish model (pictured). 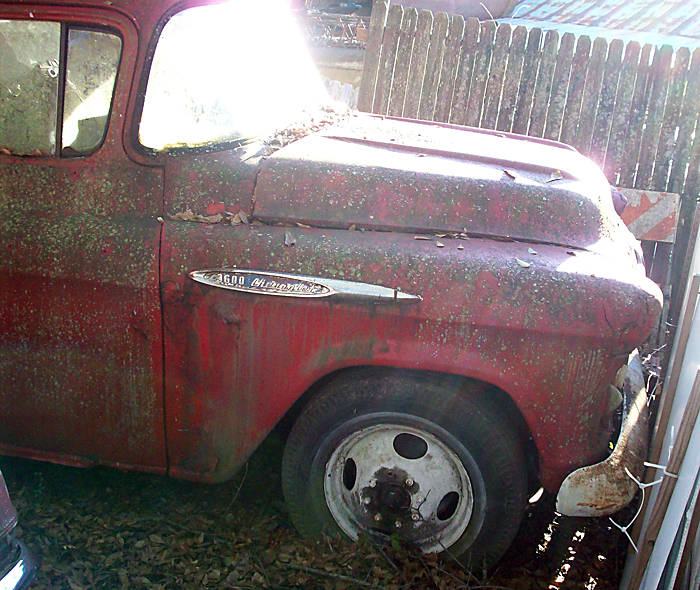 A quick search of the web turns up solid, original Willys wagons from $8,000 - $19,000. 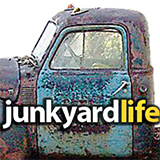 You can find junkyardlife-variety Willys wagon beaters on Ebay for a few hundred bucks. 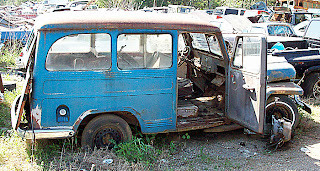 Check out more Willys wagons in three and four door models at willyscountry.com . 4-wheel drive, not the official vehicle of The Fantastic Four. 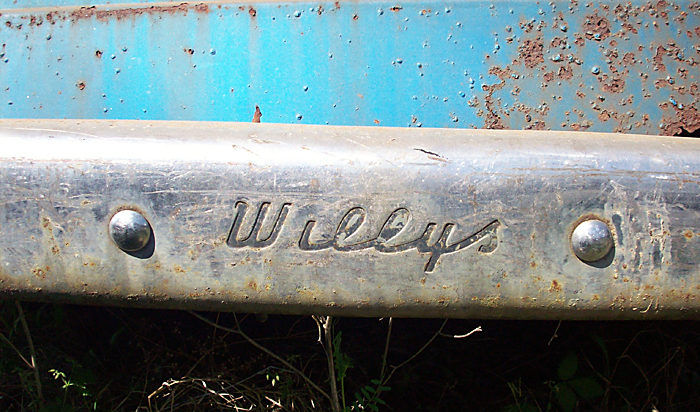 Rear bumper sports Willys signature. 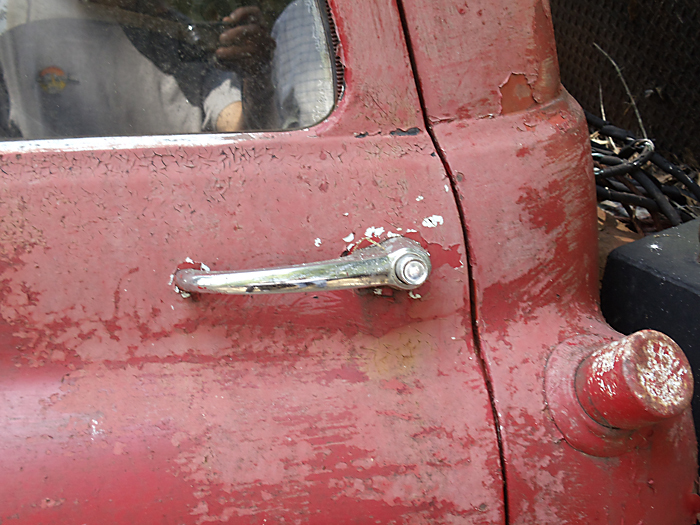 Sliding rear door was not an option on Willys station wagons. 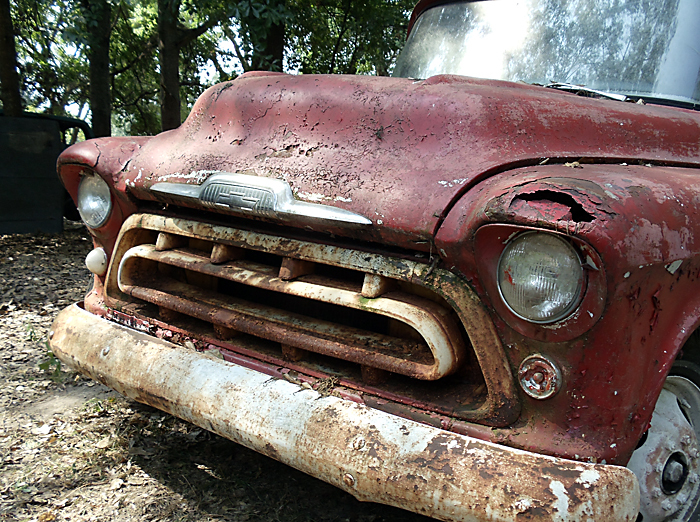 Smell the 60-year old junkyard nostalgia. 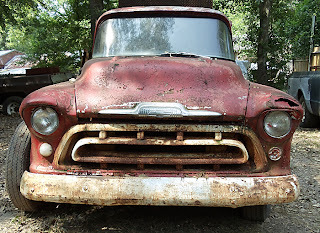 1950-53 models had a five bar grill like our junkyard find. 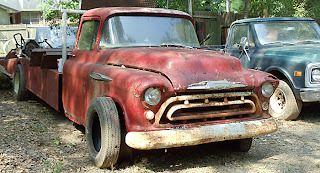 Every junkyard has a wrecker but not every 'junk' yard has a 1957 car hauler. This Chevrolet 3600 3/4 ton truck was on its way to a new owner after having been tucked away in an east Alabama backyard for a number of years. 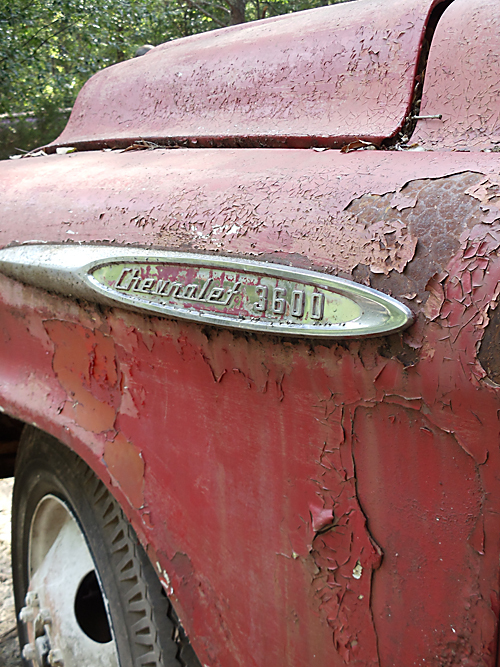 Layers of peeling, red paint scabbed the surface of the nearly 30-foot behemoth. 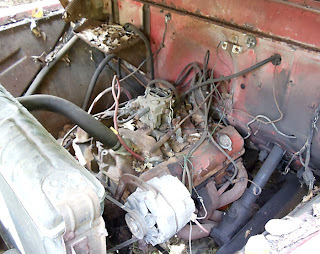 The Chevy V8 power plant appeared willing - with a bit of work - up to the task of hauling cars. Instead, a car hauler bound for Arkansas, loaded the big red '57 up and hauled her away. 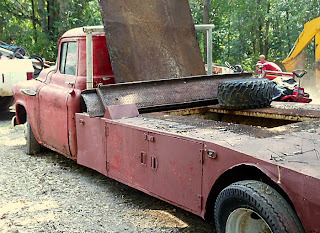 I hope she is put back on the road as a tow rig for a classic drag car.